The DVD slide show software DVD Slideshow GUI is an excellent software program for creating photo slide shows. The slide show software supports a variety of input formats including the most popular photo formats jpg and png but also avi movies. One transition effect out of more than 80 effects is automatically applied to every multimedia file that gets added to the DVD slide show software. It is possible to edit the transitions and to create custom ones from within the application's interface. It is furthermore possible to change the duration of every photo that is being displayed individually and add screen captions which can also be customized extensively. 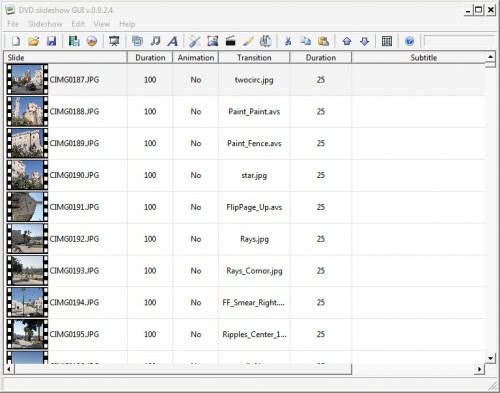 It is furthermore possible to change the photo order by clicking on an item in the table header. This is interesting if photos from a digital camera are added which are usually named sequentially. The music and background image can be customized as well. It has to be noted that it is only possible to add one mp3 file. Users with a lot of photos can easily run out of music. The recently reviewed Mp3 Merge can be used to merge multiple mp3 files to create a larger one suitable enough for the DVD slide show to be created. DVD Slideshow GUI comes with options to export the photo DVD slide show to mpg format, create DVD menus that can be imported into DVD Author or burn it directly to CD, DVD or Blu-Ray discs. 237 transitions, 83 Effects you can add to the entire slideshow, 15 Motion Backgrounds(avs). Animate your overlapping images using zoom, pan and rotate. Add photos and EXIF data and alpha channel. Add videos(avi/avs) to you slideshow. Add music, motion backgrounds, borders and subtitles. Make your own transitions, effects and motion backgrounds. Export to dvd video(PAL/NTSC 4:3 16:9), BluRay, 720p, 1080p, dvd audio, dvd chapters, dvd subtitles, avi, flash for web, avisynthscript, storyboards, single images with backgrounds. Gui in English, French, Dutch, German and Danish. DVD Slideshow GUI can install several additional software programs that are needed for specific functionality including the excellent DVD burning software ImgBurn or AviSynth. The DVD Slide show software can be downloaded from the developer's website. DVD slideshow GUI accepts m3u playlist files(with wav and mp3). M3u playlists can be made with the included Media Player Classic or most audio players like Winamp. BTW. thanks for the review. Yet again, Martin is being misleading and not getting his facts straight. There is a mighty big difference between “Photo” slide show and “DVD”. And, yet again, no link to the program. This has become a common criticism, so don’t start sending stupid comments. As of version 0.9.3.0 DVD slideshow GUI takes multiple audiofiles. The order of the music files can be sorted like the slides can be sorted – moved up/down etc.